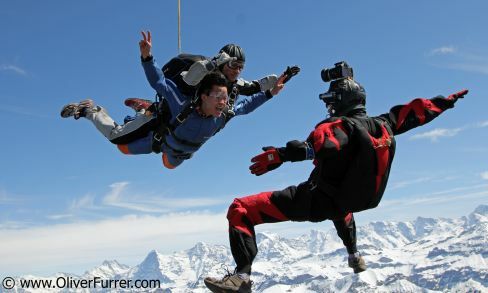 news 15.04.13: Once in your life time you should do a tandem skydive jump – this thought the young Koreans too – and if so, then certainly over the beautiful Switzerland country! Therefore the foreigner how traveled through Europe took the opportunity and did a jump over the Alps. Next to the tandem master behind his back he got filmed by an outside photographer and Korean boy had an amazing time!